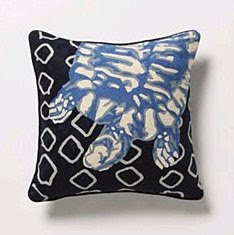 I recently fell in love with a sea turtle pillow from Anthro, and when it went on sale I snagged it up. I love the colors in it and it looks great with my brown couches. 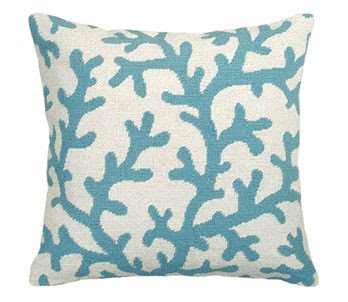 So the other night when I was trying to find the motivation to continue unpacking and I looked over at the pillow and had an inspiration...since I now live only five minutes from the beach, I'm going to decorate my condo with a beach/nautical theme. My guest bathroom is already beach themed and my bathroom has a palm tree theme -- so why not turn my condo into my own little beach bungalow. TJ Maxx and Marshalls in Mt. Pleasant have a ton of cute beach decor - so I snagged up a bunch of fun things there... I love those stores. 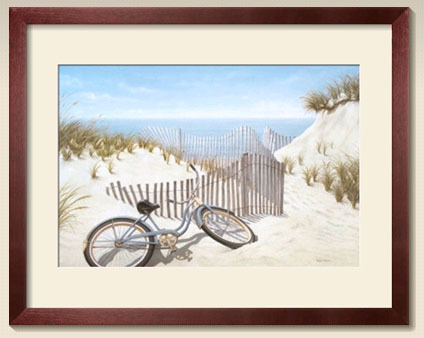 I love this painting because I can now ride MY cruiser to the beach! I need your interior decorating expertise...I have this wall right above the open bar area of my kitchen - and it will be right above my long brown couch. It's such a weird spot and I have no idea what to put there. I'll already have paintings on other walls, so I don't want to overkill with another painting...but I'm really stumped on what to put up there. I'm still unpacking...that 'stuff' won't be there necessarily. 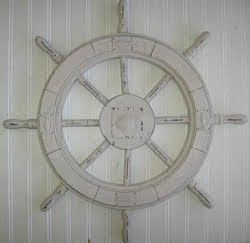 I thought about a ship wheel like this one, but I am afraid of going overkill with the whole nautical theme. Other ideas I'm throwing around is maybe finding a long horizontal beach sign - something like "Life at the beach..blah blah". I also considered making my own - finding some old wood, painting it, and putting a beachy quote on it. Another idea... buying three or four different looking clocks and setting them each to a different beach city time with the city name below each one: Charleston, Costa Rica, Hawaii, Sydney... but then I thought it might get annoying having four ticking clocks right above my head while watching TV or reading. Plus, I don't really have any connections to those other cities...and the other beaches I do have a connection to are all in the Eastern time zone. So I'm stumped... what's an easy, affordable decorating idea for that weird spot - something that will carry the theme, but not be overkill.... please comment with your ideas, links, etc. Help! Very cute! We're planning on doing our kitchen/breakfast area beach themed! May carry it over to our living room after seeing all those cute items! TJ Maxx and Homegoods are definitely the places to go. The ones by Citadel Mall also have a bunch of stuff. If you want to spend a little more GDC is a good place to stop by. 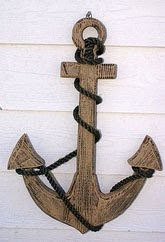 Check out Etsy stuff too - I'm always finding cute things there, and there are always nautical themed things around. 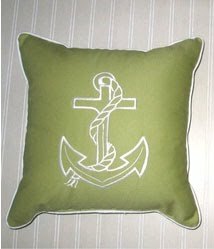 Search nautical or beach decor and you'll see. What about nautical flags? Too yacht club maybe. Love the idea though, I'm so jealous you get to live there! What about hanging nautical plates? Or nautical flags? I like the oar and ship wheel idea. I'll send you some photos of what I have to hang up. Also where did you get the anchor? I wish I had bought one I saw at Michaels months ago! Love the oar idea! 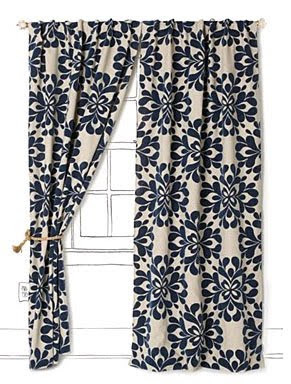 Might be cute to have 2 beach worn/distressed oars hanging parallel to each other, pointing in the opposite direction. Or maybe a large mirror (or several small mirrors) bordered with seashells and/or oyster shells. Try this post from today at http://blog.livelikeyou.com. She has a good posting on a classic beach look without looking themey.